I am FINALLY getting around to posting this! On September 13, I wrote a post about changes to the original Disney Parks and how people were reacting to them. The post concludes with an introduction to former Disney Cast Member, Don Payne, and 2 questions I had asked him about changes in the parks. Well, since then, we’ve seen even more changes! The most notable to me is that alcohol will now be served in the Magic Kingdom at Walt Disney World in the new Be Our Guest restaurant in New Fantasyland. Although alcohol will only be sold in the restaurant, as opposed to the availability at EPCOT, there are still those who feel that this breaks with Walt’s vision for the park. Keeping that in mind, let’s get on to the questions and Don’s answers! Pete: What area(s) do you think should be continually developed / refurbished / etc. in a manner that Walt would have approved of? Don Payne: Walt, in my humble opinion, would expect to see Tomorrowland updated on a regular basis. I don’t think he’d appreciate the current version. Pete: Why do you feel that way? Don: The current entry to Tomorrowland, to me, feels cramped and closed-in. It’s not really a welcoming, intriguing or open invitation to explore this area. The “rock” outcropping entrance makes NO sense and has no real context relating to “tomorrow.” At least, the previous flowerbed entrance was FAR more open, colorful and appealing than are the current, heavy and “enclosing” rock effects. Tomorrowland was supposed to be about “tomorrow.” It was supposed to be an exploration and taste-of-the-possible-future experience, spotlighting an exploration of projected… or cutting edge… developments in science, technology, the arts, etc. For example, Circle Vision 360 surpassed the development of the exciting, fairly new “Cinerama” format in the “America the Beautiful” attraction. “The House of Tomorrow” was a more forward-looking (if not slightly cheesy,) glimpse into the future… for its time. I can remember huge phone booths that had speakerphones… something that was not a public accessible experience, in those days. It was SO much fun… and such a kick… to stuff the entire group into the large phone booth and make a call to a friend or family member. Everyone could actually listen and talk… all at the same time! Amazing! They had an interesting demonstration of a “video phone,” which was nearly unimaginable, back then. 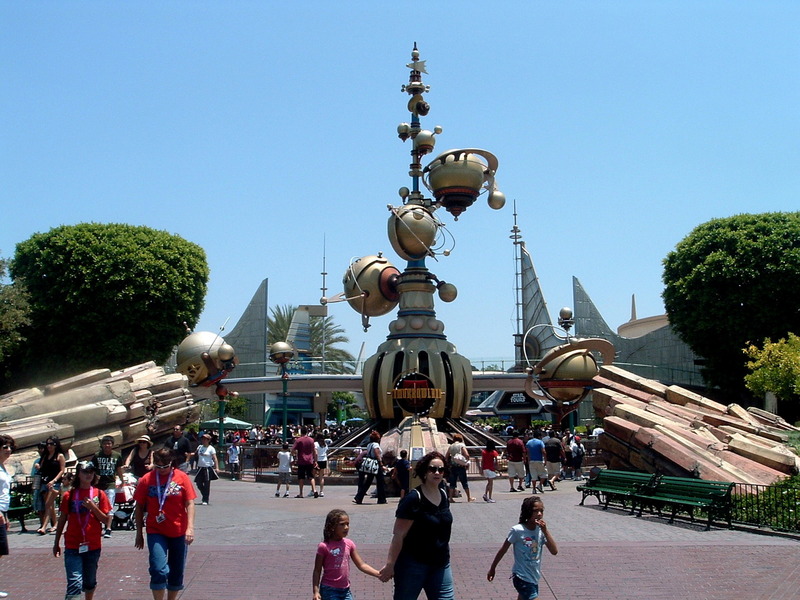 Today, we get Star Wars… er, um… “Tours,” and Captain EO (also a bit “cheesy”)… which has nothing to do with the actual future… unless your outlook of the future is whimsical, branded fantasy. Space Mountain is fun… if not futuristic. A roller coaster is a roller coaster. At least it LOOKS futuristic! “Innoventions” is closer to what Walt envisioned for “Tomorrowland, I believe. A lot of what is today’s “Tomorrowland” feels like re-worked, older attractions that have had a pseudo-futuristic facelift. I don’t believe ANY version of “Tomorrowland” was intended to be relevant for very long. I believe Walt intended regular make-over’s and up-date’s for this section of his park. In reality, “tomorrow” can only exist in our imagination… until we get there, via the passage of time. In my humble opinion, today’s “Tomorrowland” is not, nearly, as imaginative, educational, interesting or stimulating… as it once was. What we can see here, which is also mentioned in the Imagineering Disney post, is that the original architecture seems to be all but obscured by gewgaw adornments and signs now. The “now” image also exemplifies what Don referred to in his comments regarding the loss of the futuristic theme; “Mission To Mars” is now “Stitch’s Great Escape” and the Circle Vision 360 film “America the Beautiful” is now the Monsters Inc. “Laugh Floor” attraction. The question is, is this progress? This entry was posted in Tomorrowland and tagged Disneyland, Magic Kingdom, Monsters Inc., Stitch's Great Escape, Tomorrowland. Bookmark the permalink. In the “now and then” pictures of Tomorrowland @ WDW, the “now” looks more like Vegas than the future. I picture the future as streamlined, neat, organized and ultra-efficient. I agree, Jan! I think the sleekness of the original architecture is buried under the new material.